While no update is expected at the Sept. 7 Apple event, a long-awaited refresh of the MacBook Pro has two obvious main processor choices —but what it has selected to use will dictate if the computer releases sooner, or later. Relatively speaking, it has been a long time since the MacBook Pro was last updated. Even then, some of the choices made in the 2015 revisions lead to some collective head-scratching, with Apple choosing to continue to use the Haswell processor, long after its replacement. Other than a brief period of time in 2005 and 2006, Apple wasn't known for using the newest processors in its consumer goods. Upon Steve Jobs' return to Apple, he brought with him NeXT materials and source code, which included the NeXTStep operating system. While thoroughly unsuccessful on a commercial basis, it was the launching pad for Tim Berners-Lee's intial web browser efforts. It had versions for not only the PowerPC, but Intel architecture as well. Apple's 1997 purchase of NeXT and NeXTStep paved the way for not just OS X, but iOS, and a much later Intel version of OS X.
Apple invested a great deal of money in the early part of the 21st century debunking the megahertz myth. IBM and Motorola's long-term failure to keep up with Intel, even with multiple processors, ultimately proved to be PowerPC's undoing. In June 2005, Apple CEO Steve Jobs demonstrated a preview version of OS X 10.4.1 "Tiger" that was running on an early development Intel Mac. Early development kits were a single-core 3.6GHz Pentium 4. At the demo, Jobs said that OS X had been leading a "secret double life." For five years, every release of OS X had been compiled for both PowerPC and Intel hardware. The Core Solo and Core Duo processors debuted on the Intel Mac mini in 2006. Intel originally developed the Core-series processors that debuted on Apple hardware on "Tick-Tock" development cycle, with major advancements such as a smaller processor die on the "tick," with refinements and power requirement reductions on the "tock." In the summer of 2015, Intel informed investors that it was moving to a "tick-tock-tock" cycle, as it was having difficulty with the rapid rate of development of the chips, and experienced problems with the shift to a 10nm manufacturing process, from the 14nm process used to develop the fifth generation Broadwell. 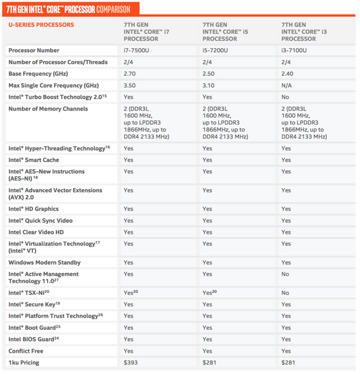 The current MacBook Pro line last updated in 2015 utilizes Haswell and Broadwell processors, depending on model. 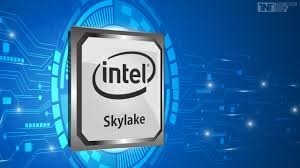 Skylake is the sixth generation of the chip family. 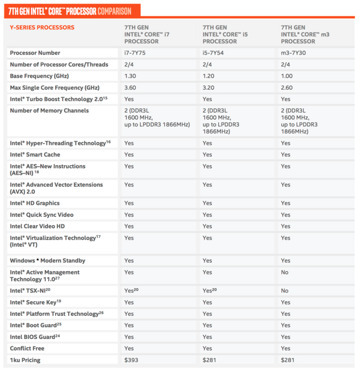 It repeats the 14nm fabrication process as used in Broadwell. It comes in four variants, is the first chip to discontinue native VGA support, and has rudimentary Thunderbolt 3 support with limited 4K capability without the "Alpine Ridge" Thunderbolt controller chip. Advantages from Broadwell to Skylake are primarily in energy consumption and native graphics performance. Apple uses Skylake processors in the 2016 MacBook. The seventh generation of the Intel Core-family chip is called Kaby Lake. It uses the same 14nm process as Skylake, and adds native USB 3.1 Generation 2 support, bringing full 10 Gbps speeds to the protocol. Skylake and earlier processors require a discrete controller chip for the faster USB 3.1 Generation 2, with the 2016 12-inch MacBook still being limited to 5 Gbps with inclusion of USB 3.1 Generation 1. Also included in the seventh generation Kaby Lake processor is full, integrated support for the 40 Gbps Thunderbolt 3, which uses the same connector as USB 3.1 type C, as well as the ability to use "passive" cabling for 10 Gbps speeds. Thunderbolt 3 has sufficient bandwidth to drive a pair of 4K displays at 60Hz, and contains HDMI 2.0 and DisplayPort 1.2. Expected in Kaby Lake are integrated graphics speed improvements over Skylake, but the magnitude of the speed boost isn't known at this time, beyond Intel marketing claims in the low-end laptop and tablet chips. Notable in Kaby Lake is support for Intel Optane technology. Optane is Intel's name for next-generation storage, with future speeds of possibly up to 1000 times faster than flash memory, and significantly less latency than NAND SSDs. 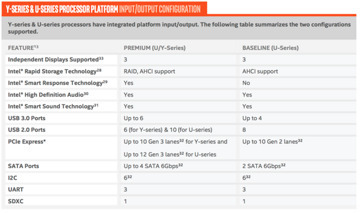 Kaby Lake will ultimately have five classes of processors, with two classes for mobile devices and tablets; one for laptops; and two spanning servers, high-power workstations, and desktops. At present, only the mobile device and tablet classes are shipping, and only very recently were details made public about the technical specifications. Processors suitable for the MacBook Pro (and desktop-class processors) aren't expected until the end of 2016 at the earliest. The days of Apple getting the first shipments of a new processor are well behind it. We have little faith that Apple will be the first vendor to supply a Kaby Lake desktop replacement laptop. That leaves only Skylake available for a September release, unless CEO Tim Cook has something up his sleeve. While it is accurate that the first quad-core Skylake processors suitable for a MacBook Pro have only recently started shipping, there were other options before the April release of that particular model. A laptop Xeon processor was available in January, which could have been used, which met all the criteria that "power users" demand from the hardware —but Apple chose to not use it. Compounding the problem of a long update period, the forthcoming Kaby Lake S-series has significant features that would be great to have in a refreshed MacBook Pro. Full, native support for Thunderbolt 3, and full speed USB 3.1 Generation 2 are big, but given Apple's inclusion of integrated graphics in the MacBook Pro, the improvements that Kaby Lake will have would be greatly welcomed. From a benchmark perspective, the 2012 Retina MacBook Pro with a 2.3 GHz i7 processor is only slightly behind the 2.2GHz i7 mid-2015 Retina MacBook Pro. That isn't Apple's fault, though —Intel's delivered their end of the bargain with new processors, but the new silicon hasn't been that compelling from a sheer speed point of view. The last few iterations of Intel chips have seen only slight increases in performance, most in battery life. Apple's battery technology and control over the hardware has mitigated the negative marketplace effect of not moving to a newer processor in the interest of long battery life, but that time is soon to be over. Apple is bleeding Mac users, mostly from the content producing side from lack of updates because of the infrequent updates. The loss and overall market perception of the Mac lines for professionals has gotten so bad, that HP's line of workstations was promoted with a network access function to allow macOS users left in the dust to do "heavy lifting" remotely. It's well past time for Apple to update. Cook and company can't wait for Kaby Lake if it wants to retain the "pro" user cadre, but it may already be too late.